Here are some facts about the Angel of the North. 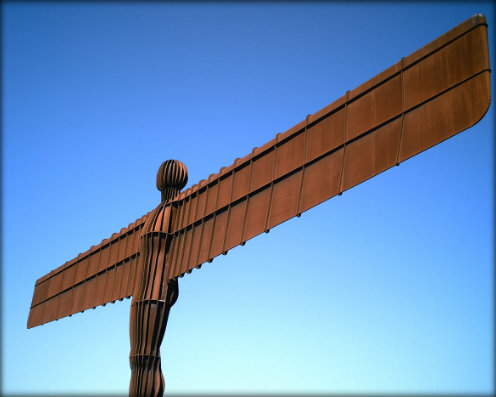 The Angel of the North is a steel sculpture, located in Gateshead in the north of England. It is on a hill on the south edge of Low Fell, overlooking two busy main roads. The sculpture was designed by Antony Gormley, a well known British artist. It is said to represent the transition from an industrial age to an information age, as well as symbolizing people’s dreams. The statue, which is orange in colour, resembles an angel and is 66 feet high. The outstretched wings are angled slightly forward and measure almost 180 feet across. A door provides access to the hollow interior, for safety inspections. The Angel of the North was designed to withstand 100 mph winds and to last for at least 100 years. An estimated 90,000 people every day see the Angel of the North, or one person every second, making it one of the most viewed works of art in the world. There is enough steel in the huge sculpture to make 16 double decker buses. The sculpture is anchored to the solid rock by huge 50 feet concrete piles. The sculpture, which is Britain’s largest, has been described as a masterpiece. However, its critics have said it looks a bit like a giant clothes peg. It took an entire day to assemble the sculpture and the event was broadcast on TV around the world. It was delivered to the site in 25 different sections. Almost 100 bolts attach each wing to the angel’s body. The sculpture also contains a hollow steel tube which adds stability and mirrors the shape of the body. A species of daffodil which is orange in colour and grows tall has been named the Angel of the North daffodil. The species is registered with Britain’s Royal Horticultural Society.